When you think of Jimmy Carter, what are the first words you think of? Are they strong, courageous and independent? Chances are probably not. When it comes to thinking about the man from Plains, Ga., a majority of people wouldn’t use any of those words to describe his time as President. They may use those words when talking about Carter’s humanitarian efforts with organizations like Habitat for Humanity, but when it comes to his presidency, it would be safe to say that the national attitude is negative. Most people, especially conservatives, feel Carter failed to deal with the international and economic woes of the 1970s, and it was up to his successor, Ronald Reagan, to lead America to greatness once again. But are these feelings towards Carter fair? Granted, there were problems that arose during Carter’s time in office, but that does not mean we should dismiss his presidency as four years America will not get back. In fact, Carter did a tremendous amount of work that often gets overlooked. Carter working at his desk. Photo courtesy of the National Archives and Records Administration. When it comes to economics, Carter faced an economy weighed down by inflation, high unemployment and an energy crisis. Some would say it wasn’t until Reagan that these problems were fixed and the economy began to roar, but without Carter, the booming economy of the 1980s would not have been possible. As shocking as it may sound, the Carter administration was a leader in deregulation. While these efforts were not perfect, they did help lay the groundwork for a stronger economy while also transforming the luxuries of the 1970s into some of the common services we use today. When it came to the travel industry, Carter led the deregulation of the airline industry, which resulted in making flying a normal method of travel instead of a luxury for a selected few. As a result, airfares fell nearly 40 percent between 1980 and 1996. Later in his term, he even started to deregulate the trucking and railroad industries. Even though the plan was started, it eventually was delayed then dismantled by Reagan to fulfill a promise he made with the Teamster’s Union in return for an endorsement. Carter also helped push the antitrust suit against AT&T, which ultimately led to the breakup of the corporation and the formation of new companies, many of which provided telecommunication services for a cheaper rate. Granted, a better way to have handled this situation would have been, in the words of William L. Anderson of the Mises Institute, to “have deprived AT&T of its legal monopoly status.” Regardless, Carter’s actions without a doubt promoted competition as new phone companies and new jobs were created. Despite this blemish, total decontrol was scheduled for spring 1981, but as Reagan entered office, controls were lifted almost immediately, giving Reagan credit for saving the oil industry. Unfortunately for Carter, inflation rates were high and unemployment rates were at an uncomfortable level (even though unemployment did decrease from 7.5 percent in January 1977 to 5.6 percent by May 1979), making Reaganomics seem like the better option, helping Reagan win the 1980 election and giving the Gipper credit for saving the economy. But in actuality, it was Carter, not Reagan, who helped create economic prosperity, for without Carter’s path of deregulation, recovery would not have been possible to achieve. Shifting to the subject of foreign affairs, Carter did a great job… minus a certain hostage situation that will be discussed later. The Carter administration managed to do the impossible by not only strengthen in the United States’ standing abroad, but also promoting diplomacy through the least violent means possible. Highlights include improving diplomatic relations with China by officially transferring diplomatic recognition from Taiwan to the mainland, opening the door for the current diplomatic relationship we have with the nation today. The administration also returned the Panama Canal to Panama, which removed part of America’s overbearing presence from Latin America, possibly preventing a Vietnam War-like scenario. It was Carter himself who helped broker Israeli-Egyptian peace with the Camp David Accords. 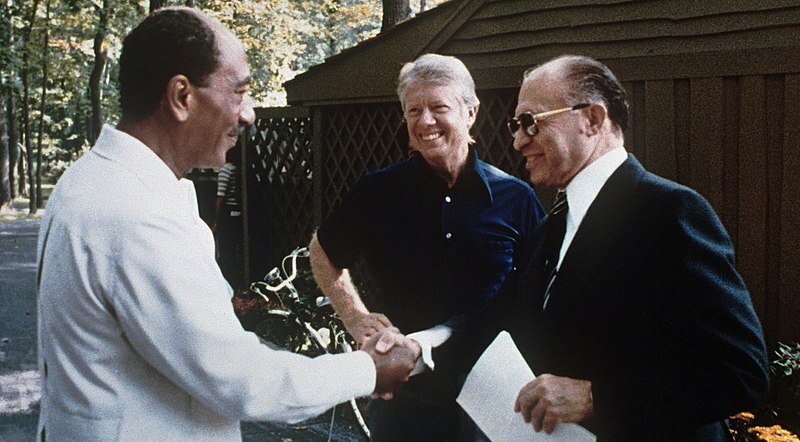 Israeli Prime Minister Menachem Begin and Egyptian President Anwar Sadat with Carter at Camp David in 1978. Photo courtesy of the United States Government. Carter’s plan for dealing was the Soviets was unique, being simultaneously peaceful and threatening. On one hand, Carter supported the SALT II treaty, which would have curtailed the manufacturing of nuclear weapons (it ended up not ratified by the Congress). On the other hand, Carter also proposed the development of 200 missiles to counter an uncontrolled build-up by the Soviets. Yet, the most threatening thing Carter ever did was boycott the 1980 Olympic Games in Moscow as a protest against the Soviet invasion of Afghanistan. While some may scorn him for ruining many athletes’ only chance for Olympic gold, it was a very interesting yet nonviolent strategy for dealing with a bully. In fact, Carter kept the nation at peace and is one of the few presidents who never led America to war. While some may see that as weakness, it should be seen as a strength. Being able to sit down and talk about your issues or refusing to associate yourself with unethical individuals takes a fair amount of patience, especially if you want to make an important statement . In this aspect, Carter should be praised for his diplomacy and should be a shining example of how a president should handle foreign affairs. Finally, Carter most certainly had a positive persona to him. He didn’t come off as a typical politician, but instead someone who would be willing to risk even his own standing if it was for the benefit of the greater good. An early example of this would be a May 4, 1974 speech Carter gave at the University of Georgia while he was serving as governor of the Peach State. In attendance of this speech were numerous state legislative members, judges and then-Massachusetts Senator Ted Kennedy, who was speculated to be a serious contender in the 1976 Presidential election. The race at the time had no frontrunner, and during a period where Americans’ trust towards the government was quickly deteriorating due to Watergate, there was a need for someone to come out and advocate for change in the political system. No one knew who or how it was going to happen, but something needed to change. Once Carter opened his mouth, everything did in fact changed. Carter used this speech to address the various defects of both the Georgia judicial system and the American political system. Unlike many politicians before him, Carter pointed out the system he was a part of was not based in equality, but instead protecting the rich and powerful. While reflecting on the speech many years later, Carter remarked that reaction of the crowd was “one of stunned silence.” No one in the room knew how to react to Carter’s speech, yet that’s what made it fantastic. 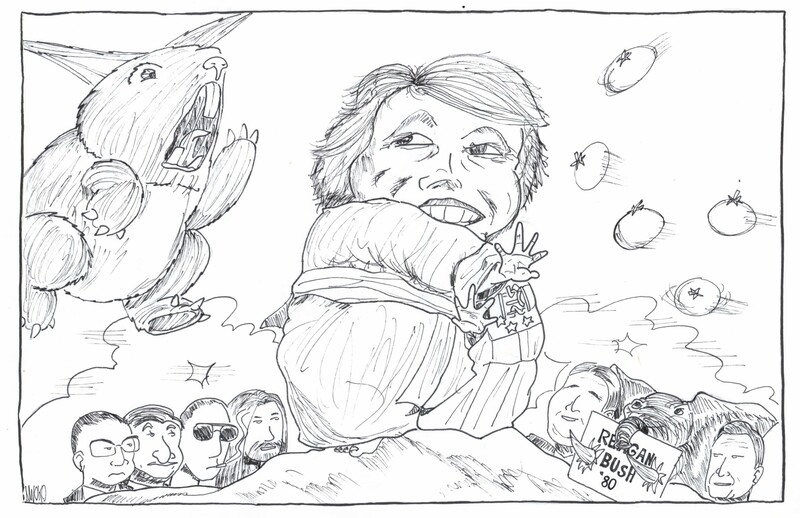 It was something so different from the prominent political culture, it ended up being the moment that caught people’s attention and later propelled Carter to the national political stage. He even received endorsements from cultural icons like Dr. Hunter S. Thompson and the Macon, Ga.-based Allman Brothers Band. 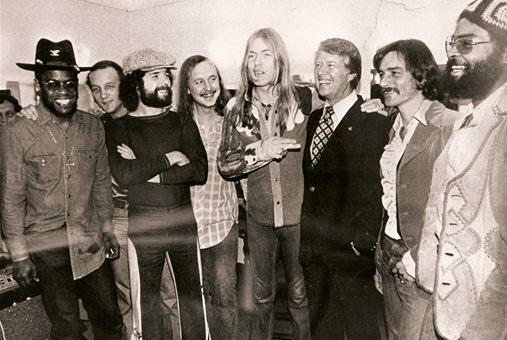 Carter with the Allman Brothers Band in 1975. Photo courtesy of Gregg Allman and William Morrow. With all of this evidence supporting Carter’s time as president, does that mean he deserves to be considered as one of the best presidents of all time? Not in the slightest. While Carter did have his great moments, some of his actions while president are some of the worst actions made by a president in recent history. In terms of bureaucratic power, Carter gave the federal government more responsibilities and even more control over our lives. He was instrumental in the creation of the Department of Energy and the Department of Education. While both departments seem like good ideas on paper, neither has done anything but waste our tax dollars, placing the federal government in an area they had no purpose being in in the first place. In terms of foreign policy, his most known escapade was his shoddy handling of the Iran Hostage Crisis. After Iranian students overran the American embassy, seizing more than 60 Americans, Carter went through multiple plans to get these Americans free. This includes economic sanctions and a poorly executed rescue operation, neither of which worked. Eventually, Carter did negotiate a deal with the Iranians, but it took 444 days for that deal to be met, making the United States look weak not only in front of a global audience, but also the Soviet Union. Even Carter’s persona was starting to get on everyone’s nerves. His efforts to come off as average, which include his 1979 Crisis of Confidence Speech addressing the doubts raised about the nation’s future, came off as unpatriotic to some and ridiculous to others. This speech in addition to the Iran Hostage Crisis, the weak economy, a growth in bureaucracy and Carter’s goofy personal life (including an incident of getting “attacked” by a swamp rabbit while fishing) gave the Reagan-Bush ticket the edge in the 1980 Presidential election. Do I think Carter is one of the greatest presidents of all time? Absolutely not. While his negatives are few, they surely do damage his presidency overall. However, I do not think he deserves the negativity he currently gets. 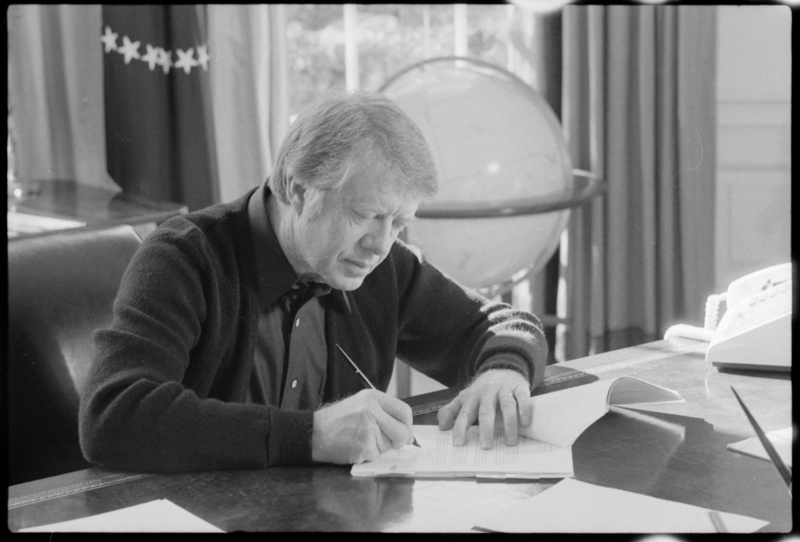 While his accomplishments may not be widely recognized, America could not be what it is today without Jimmy Carter. Maybe it is time we associate words like strong, courageous and independent with Jimmy Carter’s presidency. It was those traits that made Carter a great president, which as a result made America a great nation.